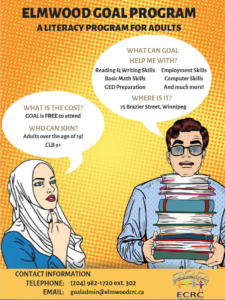 As we prepare to enter in a new year of 2017, there are many youth in Elmwood who don’t have a safe place to be, don’t have access to food, don’t have a support system and role model to teach them essential skills in order to be successful Winnipeggers. 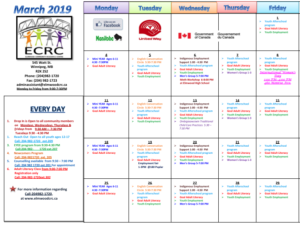 At the Elmwood Community Resource Centre (ECRC), we build community in Elmwood with resources and supports that make the neighbourhood a great place to live, work and raise a family. Our Vision is to have community of positive outcomes for everyone involved. By involving the youth in our community, we strongly believe that if people feel good about themselves and their achievements, it will encourage them to make informed and positive life choices. Capacity building is essential in a youth’s life and we want to build their self -esteems with a lot of encouragement, positive role modelling, and mentoring. Our after school youth program allows youth to participate in positive and encouraging activities while also educating and providing engaging opportunities. In the program, we use a wrap-around strength-based approach to enhance community impact, while collaborating with everyone involved in the youth lives. Youth are the leaders of tomorrow and we would like to pave the way to a bright future for our youth. 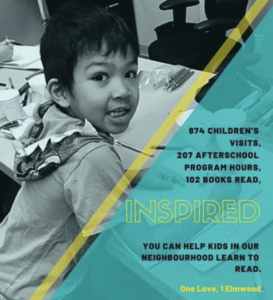 By helping us raise $30,000 for the After school youth program, you will be helping us to provide valuable tools to Elmwood Youth that will continue to assist them throughout life and in future careers. Not only are you helping them learn , but you are providing opportunities and creating feelings of empowerment that promote a sense of belonging within the community. Furthermore, the funds will help us to provide 5 days a week programming with healthy meals, transportation and opportunities to create various educational activities. For immediate impact, give online now, in person at our 75 Brazier street location and or by mail. Thank you In advance for sharing your own bounty with youth in Elmwood!